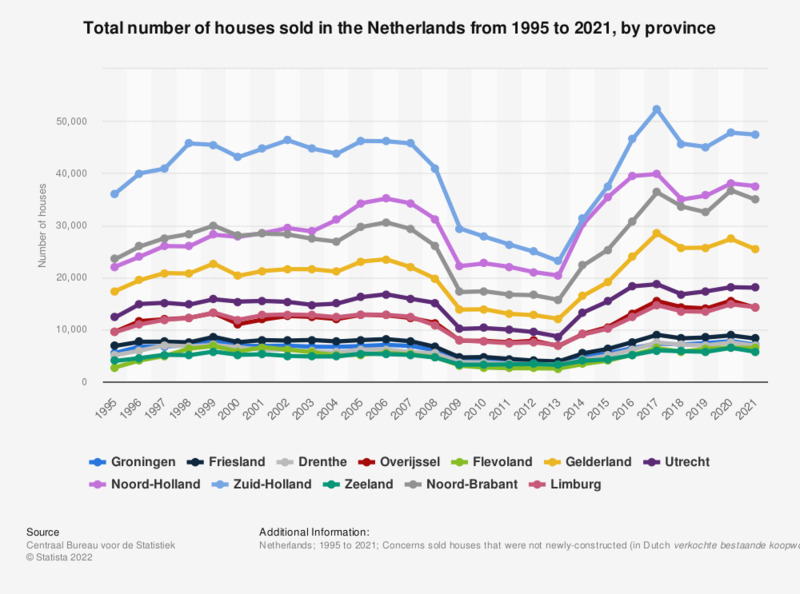 This statistic shows the total number of houses sold in the Netherlands from 1995 to 2017, by province. In 2016, the total number of houses sold in the Netherlands more than 241,000, of which approximately 19,000 were sold in the province of Utrecht. The European housing, or residential real estate, market has recently shown clear signs of recovery, with an increasing house price being the main trend. In recent years, the housing market has continued to rise in the Netherlands due to low mortgage rates, a recovering economy and a high level of consumer confidence. For example, the average selling price of houses was higher in 2016 than in 2013, when prices reached a low point. In 2018, real estate prices are expected to increase with six percent as a high number of sales, combined with an increasingly scarce supply, are expected to push the housing price up. In the four largest municipalities, the demand of housing outweighs the supply. In December 2016, the average number of houses for sale in the municipality of Amsterdam was approximately 1,800 with this number reaching an average of 4,300 in December 2014. The number of houses sold in the Netherlands consist of purchases of a house registered at the Dutch Cadastre (Kadaster).